China is now the world’s largest gaming market with annual revenues surging towards USD 30 billion and it may already be New Zealand’s largest market too. The New Zealand ESports Federation (NZESF) was established in March 2016. It was established by a group of gamers and business people who saw the opportunity presented by esports and the absence of a governing body in New Zealand. During the opening of NZGDC17 last week we announced the winners of Kiwi Game Starter 2017! 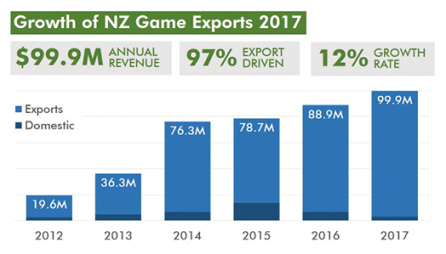 New Zealand’s game developers earned $99.87M in the financial year ending 31 March 2017 according to an independent survey of New Zealand Game Developers Association studios. That’s double-digit growth of 12% in the last year, up from to $88.9m in FY2016. 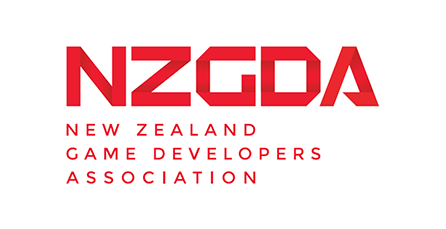 The New Zealand Game Developers Association would like to welcome our board members for 2017/2018. This year there were nine candidates for board, which is the exact number of positions available. Primary and secondary students made dozens of digital games and board games as part of a national education competition. The best of these are now online in a winners’ showcase, including two games you can play during your coffee break. 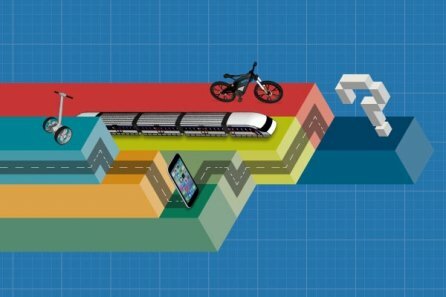 Kiwi Game Starter 2017 Finalists! 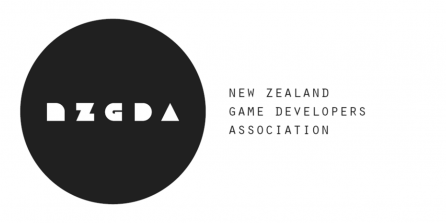 The NZGDA is excited to announce our finalists for this year’s Kiwi Game Starter 2017! 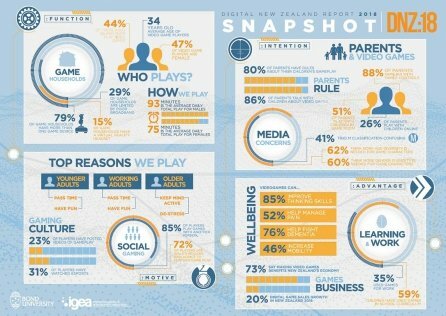 New research by Bond University in Queensland and the Interactive Games & Entertainment Association (IGEA) has found a staggering 98 per cent of New Zealand families have video game devices, eight out of 10 owning multiple game devices. Are you a community minded game developer who wants to help grow New Zealand’s game development sector? Then consider standing for the New Zealand Game Developers Association 2017 board!